Several years ago, I shared a post about my 11 favorite blogs that I read on a regular basis. However, that post is now VERY outdated. A handful of those blogs no longer exist anymore and many of them are posting infrequently or have totally changed their topic so I’m not as interested in them anymore. FYI: No baby yet — I promise you’ll know when he arrives! Please note that by no means do I visit all of these blogs every single day. I usually check in once a week or maybe once a month to catch up. I also subscribe to a few via email so I don’t have to check in on the actual blog. I don’t have any type of blog feed reader because for some reason, I can not get into reading blogs in a feed reader. I’d rather just visit the blog directly, or read it in an email. In fact, many of the blogs I follow are via Facebook — so I can quickly and easily skim through post titles and only click on ones that sound interesting to me. This seems to save me a lot of time and still allows me to follow several blogs without feeling overwhelmed by all the new content out there each day. So, for those of you looking for a little extra summer reading material, let me share some of my favorite blogs (and bloggers) with you! Life Your Way I get content from Mandi’s blog emailed to me once a week and enjoy reading about her family, their life out in the boonies of West Virginia, and her tips to simplify and organize. The Art of Simple I check in to see what Tsh and the gang is doing once a month. Most of her blog doesn’t really apply to me, but she does have some great ideas. Money Saving Mom I don’t read for the deals, just Crystal’s amazing time management, organizing, business advice! Little House Living This is another blog that I only check in on about once a month — but I’m always intrigued by Merissa’s super simple, self-sustaining lifestyle. Clean Mama Becky always has fabulous tips and tricks to clean just about EVERY area of your home and life. Plus, she has lots of DIY recipes for cleaning products. Clover Lane Sarah has 6 busy children, but somehow manages to find time to slow down, simplify, stay organized, and enjoy life with her family. I aspire to be like her “when I grown up”! Liz Marie Blog Although I truly don’t implement any of her ideas right now, I LOVE her style — and she went to my high school so it’s fun to follow along and see what she’s up to. The Lemon Bowl Liz is a local West Michigan blogger and although we don’t have exactly the same style of cooking, her photos are amazing, and she’s a great writer. A Farmgirl’s Dabbles I usually pop in to check out Brenda’s new recipes once a month or so. Eat 2 Gather Sheila is another local blogger (she only lives a few miles from my house) and her recipes are totally doable for “normal” families! Kid’s Activity Blog they have hundreds of cool ideas for kids! I usually just visit when I’m searching for something specific. GR Kids The “GR” is for Grand Rapids — which is the closet major city to where we live. This blog focuses on all the fun and cool activities for kids in the area so it’s a great resource if/when we’re looking for something to do. Your Kid’s Table I started following this blog when we were having difficulties getting Nora to eat. And although I’m not sure it helped me solve anything, it does have TONS of great tips and ideas for feeding kids healthy, balanced meals. Truth in the Tinsel This is more of a seasonal blog — but I love how Amanda has a knack for helping children understand the Christmas story and other Biblical messages with her creative teachings, ebooks, crafts, etc. Easy to Love but Hard to Raise I think you can probably get the gist of this website’s content just by the title! Although everything certainly is not applicable to me or my family, I have gleaned my fair share of helpful parenting tips and tricks from this blog. The Small Things Blog Ironically, this blog talks a lot about fashion, make-up, and hair (3 things I don’t have a huge interest in) but I enjoy Kate’s writing style and she also has 2 little tikes, so I can really relate to her life right now. She Just Glows Janie is another mom with 3 very young kiddos and a great writing style that I can totally relate to. I follow her via facebook and check in at least weekly for new content. Finding Joy I love the Dear Mom letters Rachel writes — and hearing more about her family. She has a great writing style and is very relatable. Of course, there are literally hundreds of blogs that I’ve clicked through to read an article here or there — or maybe I pop in once a year or so. But the list above includes the blogs I read at least once a month or more. I’m guessing many of you follow a few of these blogs already — but if not, I’d encourage you to click around and check them out. Also, I’d love to read some of YOUR favorite blogs too — feel free to leave the links in the comment section! I thought I would check out the blog Life Your Way when I saw that it was by someone in West Virginia. She actually lives in Winchester, Virginia not in West Virginia. Usually we hear just the opposite about West Virginia; people think that West Virginia is not a state (which boggles my mind). Winchester is not actually in the boonies either. I am glad that people have a misconception about West Virginia because we can then keep this BEAUTIFUL and FRIENDLY place all to ourselves. I do apologize if this came off sounding nasty in any way, I did not mean it that way. I really love your blog & read it everyday. Two of my favorite blogs are The Frugal Girl and Thrifty Frugal Mom. Stitched in Color- quoting blog, but great writing. Has a sweet 4 month old baby with some difficulties, in addition to two older kids. The House that Lars built- my friend runs this design blog- I occasionally check in for inspiration. Made by rae- seeing blogger- I think she’s sort of in your neck of the woods? I concur with Modern mrs Darcy- hard to classify but I love it! Sew mama sew- for their “Super Online Sewing match” (unofficially modeled on the great british seeing bee). Would love to hear your thoughts if you check any of these blogs out! I also read Amy Volk’s blog too. I’m sure you know about it, but I love Bloglovin’! It’s so easy to have all the blogs I want to follow in one place, and just scan through my “Feed” and click to read the ones I want, or click “mark as read” to skip over it. That being said…some of my favorite blogs are: Little Green Notebook, The Artful Parent, Mel’s Kitchen Cafe, and Heart Cries. I’ll have to check out some of these new to me ideas from your list! I’ve been neglecting my bloglovin’ blogs for a while now because I, like you, really only subscribe to a few via email and check up on others I like through social media and check ins. But, evidently your blog was in my feed reader and I have been missing out. I love this post. So many new blogs are getting added to my list and several on your list are in my list of favorites too. A favorite blog of mine that I didn’t see on your food blog list is HowSweetsEats.com. Her writing is funny and real and her photos and recipes are amazing. 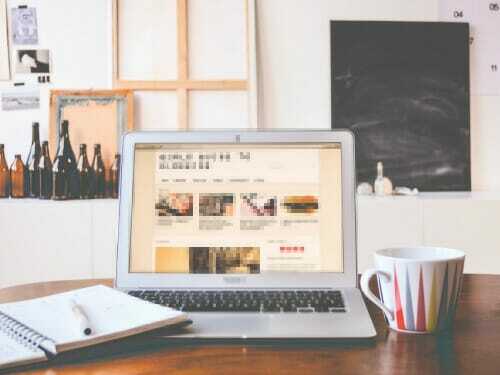 Your blog is the only one that I read every morning. I love that I can count on a post appearing at 8:00 am which I then read and then get on with my day. It’s part of my morning routine now. Both have some very informative videos which I keep up to date on through their Facebook pages. Enjoy your summer, Andrea and good luck with the new little one! I read several of the ones on your list, and I would describe them about the same way you did. I’ve been thinking about checking out Modern Mrs. Darcy for a while because I see it referenced on so many other blogs, but I haven’t done it yet! I think I first checked her site out after seeing her on Art of Simple. I subscribe by email, and she posts every 2 or 3 days which is a nice pace. Her home is beautifully simple, and her posts poetically and artfully convey the joy and beauty of everyday life. I find her site soothing to the soul, a peaceful oasis in an unquiet world. Thanks for the link JoDo! I just checked out that blog and LOVE their little house!! Thanks, I enjoyed this post. I read it this morning in bed with my nursing toddler in Feedly. For me that works. And the Nester. It does not have to be perfect to be beautiful. And she is slow rennoing an old farmhouse too. oh yes, I’ve visited the Nester’s blog a bunch — but I guess it’s been quite a while since I’ve been over there. I just recently came across Clean Mama and love it. I even ordered her book and am excited to use some of the cleaners. Obviously this one! =) And I read IHeart Organizing too. Others include A Bowl Full of Lemons (though it’s become very quiet over there lately) and Zen Habits (all about minimalism and creating good habits). This is cool! Thanks to your info on one of the blogs I was able to remake my morning so I’m able to accomplish more and be on time at work every day now. I’ll check out some of these other blogs for some of the things I have interest in. Have a great summer break and will look forward to your once a month blog. Praying you’ll have the baby soon. I just love Addicted 2 Decorating. Kristi does DIY projects in real time and has the BEST tutorials. So nice to see how long it actually takes to get something done. Her projects are inspiring too. She does most of them all by herself and is amazing! Check her out! Your blog and Money Saving Mom are the ones I read the most (like you, I “skip the deals”). I also enjoy Art of Simple and Oh Amanda (Truth in the Tinsel’s “all year long” site). But am sometimes a little overwhelmed by their writing styles so I don’t read them faithfully. wow — what a great list. Thanks for sharing! Thanks for the great list of blogs Andrea! I’ve taken a quick peek at all of them this morning and already in love with a couple of them! I’m looking forward to searching thru more of them and finding useful tips! I am fairly new to blog reading and following so yours is honestly the only one I truly flow and enjoy so I’m hoping I can add to that list! Thanks! well, I’m certainly glad you’re following my blog 🙂 Hopefully a few more of these will interest you as well!! Also check out nieniedialogues.blogspot.com! Very inspiring. Love your blog! Thanks Lori — I’ll check that one out! I also enjoy http://www.thefrugalgirl.com/. She has a very down-to-earth, practical, no-nonsense style and she takes lovely photos! I used to read many of the “big name” bloggers, but most of their blogs have turned into money-making machines, and I enjoy the more personal approach so much more. I love thefrugalgirl blog too. Been following her for years. And I completely agree about the big name bloggers. Aww, thanks for the kind words, you guys! Thanks for sharing your list. Hope all goes well this week and that baby decides it’s time to arrive! Can’t wait for baby news— I bet your can’t either!!! I love Rachel from Finding Joy as well. Her site is wonderful, she speaks from the heart and is just as sweet in person! Andrea, I read so many of those, too, and I love them! There are a few I haven’t heard of, so I’ll definitely be checking them out. Thanks for sharing your list. Your blog is definitely on my “must read” list. I just love it. And I’m so excited to find out when your baby boy arrives! Good luck in the last leg of your journey and an early congrats!